A gentle giant passed this weekend. 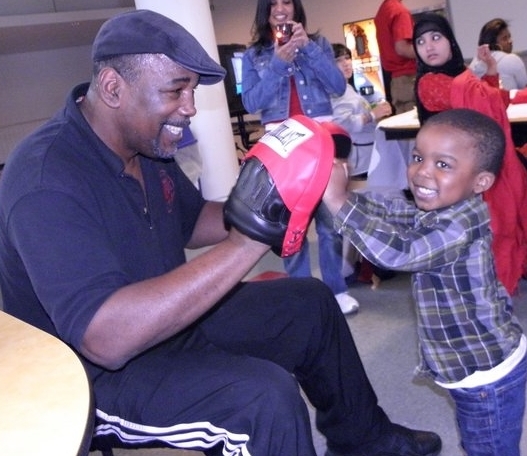 We would like to honor the life of Mr. Matthew Saad Muhammad, famed boxer and homelessness advocate. Matthew first became involved with One Step Away when he found himself in the Ridge Avenue Shelter in 2010. After overcoming homelessness for the second time in his life, he became an advocate for our Knock Out Homelessness campaign. Although he is no longer with us, his spirit will live on, and we will never forget his contributions to the sport of boxing and the homeless community. Our condolences go out to his family and friends. Matthew’s family will be having a private service, with plans for a larger memorial to accommodate his many fans and friends across the country still being made. He served well. May his spirit soar.